"Pugilism", "Boxer", and "Prizefighter" redirect here. For other uses, see Boxing (disambiguation), Boxer (disambiguation), Boxers (disambiguation), Pugilism (disambiguation), Prizefighter (disambiguation), or Punch (combat). It has been suggested that Amateur boxing be merged into this article. (Discuss) Proposed since December 2015. While people have fought in hand-to-hand combat since before the dawn of history, the origin of boxing as an organized sport may be its acceptance by the ancient Greeks as an Olympic game in 688 BC. Boxing evolved from 16th- and 18th-century prizefights, largely in Great Britain, to the forerunner of modern boxing in the mid-19th century, again initially in Great Britain and later in the United States. A painting of Minoan youths boxing, from an Akrotiri fresco circa BCE 1500, the earliest documented use of boxing gloves. The earliest known depiction of boxing comes from a Sumerian relief in Iraq from the 3rd millennium BC. Later depictions from the 2nd millennium BC are found in reliefs from the Mesopotamian nations of Assyria and Babylonia, and in Hittite art from Asia Minor. The earliest evidence for fist fighting with any kind of gloves can be found on Minoan Crete (c. 1500–900 BC), and on Sardinia, if we consider the boxing statues of Prama mountains (c. 2000–1000 BC). Boxing was a popular spectator sport in Ancient Rome. In order for the fighters to protect themselves against their opponents they wrapped leather thongs around their fists. Eventually harder leather was used and the thong soon became a weapon. The Romans even introduced metal studs to the thongs to make the cestus which then led to a more sinister weapon called the myrmex ('limb piercer'). Fighting events were held at Roman Amphitheatres. The Roman form of boxing was often a fight until death to please the spectators who gathered at such events. However, especially in later times, purchased slaves and trained combat performers were valuable commodities, and their lives were not given up without due consideration. Often slaves were used against one another in a circle marked on the floor. This is where the term ring came from. In AD 393, during the Roman gladiator period, boxing was abolished due to excessive brutality. It was not until the late 17th century that boxing re-surfaced in London. As the wearing of swords became less common, there was renewed interest in fencing with the fists. The sport would later resurface in England during the early 16th century in the form of bare-knuckle boxing sometimes referred to as prizefighting. The first documented account of a bare-knuckle fight in England appeared in 1681 in the London Protestant Mercury, and the first English bare-knuckle champion was James Figg in 1719. This is also the time when the word "boxing" first came to be used. It should be noted, that this earliest form of modern boxing was very different. Contests in Mr. Figg's time, in addition to fist fighting, also contained fencing and cudgeling. On 6 January 1681, the first recorded boxing match took place in Britain when Christopher Monck, 2nd Duke of Albemarle (and later Lieutenant Governor of Jamaica) engineered a bout between his butler and his butcher with the latter winning the prize. These rules did allow the fighters an advantage not enjoyed by today's boxers; they permitted the fighter to drop to one knee to begin a 30-second count at any time. Thus a fighter realizing he was in trouble had an opportunity to recover. However, this was considered "unmanly" and was frequently disallowed by additional rules negotiated by the Seconds of the Boxers. Intentionally going down in modern boxing will cause the recovering fighter to lose points in the scoring system. 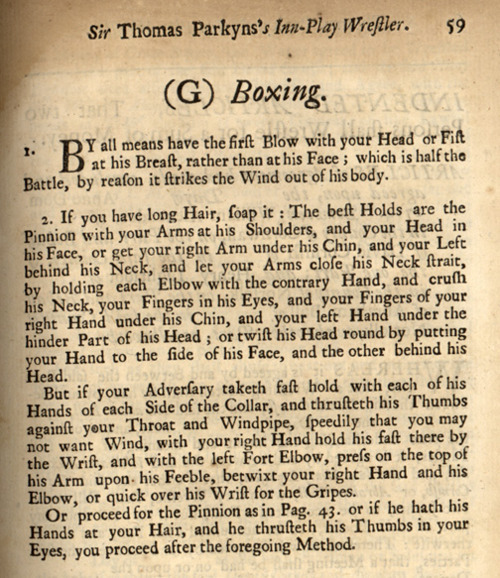 Furthermore, as the contestants did not have heavy leather gloves and wristwraps to protect their hands, they used different punching technique to preserve their hands because the head was a common target to hit full out as almost all period manuals have powerful straight punches with the whole body behind them to the face (including forehead) as the basic blows. Nicola Adams is the first female boxer to win an Olympic gold medal. Competitors wear protective headgear and gloves with a white strip or circle across the knuckle. There are cases however, where white ended gloves are not required but any solid color may be worn. The white end just is a way to make it easier for judges to score clean hits. Each competitor must have their hands properly wrapped, pre-fight, for added protection on their hands and for added cushion under the gloves. Gloves worn by the fighters must be twelve ounces in weight unless, the fighters weigh under 165 pounds, thus allowing them to wear 10 ounce gloves. A punch is considered a scoring punch only when the boxers connect with the white portion of the gloves. Each punch that lands cleanly on the head or torso with sufficient force is awarded a point. A referee monitors the fight to ensure that competitors use only legal blows. A belt worn over the torso represents the lower limit of punches – any boxer repeatedly landing low blows below the belt is disqualified. Referees also ensure that the boxers don't use holding tactics to prevent the opponent from swinging. If this occurs, the referee separates the opponents and orders them to continue boxing. Repeated holding can result in a boxer being penalized or ultimately disqualified. Referees will stop the bout if a boxer is seriously injured, if one boxer is significantly dominating the other or if the score is severely imbalanced. Amateur bouts which end this way may be noted as "RSC" (referee stopped contest) with notations for an outclassed opponent (RSCO), outscored opponent (RSCOS), injury (RSCI) or head injury (RSCH). Professional bouts are usually much longer than amateur bouts, typically ranging from ten to twelve rounds, though four-round fights are common for less experienced fighters or club fighters. There are also some two- and three-round professional bouts, especially in Australia. Through the early twentieth century, it was common for fights to have unlimited rounds, ending only when one fighter quit, benefiting high-energy fighters like Jack Dempsey. Fifteen rounds remained the internationally recognized limit for championship fights for most of the twentieth century until the early 1980s, when the death of boxer Duk Koo Kim eventually prompted the World Boxing Council and other organizations sanctioning professional boxing to reduce the limit to twelve rounds. "Style" is often defined as the strategic approach a fighter takes during a bout. No two fighters' styles are alike, as it is determined by that individual's physical and mental attributes. Three main styles exist in boxing: outside fighter ("boxer"), brawler (or "slugger"), and Inside fighter ("swarmer"). These styles may be divided into several special subgroups, such as counter puncher, etc. The main philosophy of the styles is, that each style has an advantage over one, but disadvantage over the other one. It follows the rock-paper-scissors scenario - boxer beats brawler, brawler beats swarmer, and swarmer beats boxer. Heavyweight champion Muhammad Ali is a typical example of an out-fighter. Notable out-fighters include Muhammad Ali, Larry Holmes, Joe Calzaghe Wilfredo Gómez, Salvador Sanchez, Cecilia Brækhus, Gene Tunney, Ezzard Charles, Willie Pep, Meldrick Taylor, Ricardo Lopez, Floyd Mayweather, Roy Jones, Jr., Sugar Ray Leonard, Miguel Vazquez, Sergio "Maravilla" Martínez, Vitali Klitschko, Wladimir Klitschko, and Guillermo Rigondeaux. This style was also used by fictional boxer Apollo Creed. Counter punchers are slippery, defensive style fighters who often rely on their opponent's mistakes in order to gain the advantage, whether it be on the score cards or more preferably a knockout. They use their well-rounded defense to avoid or block shots and then immediately catch the opponent off guard with a well placed and timed punch. A fight with a skilled counter-puncher can turn into a war of attrition, where each shot landed is a battle in itself. Thus, fighting against counter punchers requires constant feinting and the ability to avoid telegraphing ones attacks. To be truly successful using this style they must have good reflexes, a high level of prediction and awareness, pinpoint accuracy and speed, both in striking and in footwork. Notable counter punchers include Muhammad Ali, Vitali Klitschko, Evander Holyfield, Max Schmeling, Chris Byrd, Jim Corbett, Jack Johnson, Bernard Hopkins, Laszlo Papp, Jerry Quarry, Anselmo Moreno, James Toney, Marvin Hagler, Juan Manuel Márquez, Humberto Soto, Floyd Mayweather, Jr., Roger Mayweather, Pernell Whitaker, Sergio Gabriel Martinez and Guillermo Rigondeaux. A brawler is a fighter who generally lacks finesse and footwork in the ring, but makes up for it through sheer punching power. Mainly Irish, Irish-American, Puerto Rican, Mexican, and Mexican-American boxers popularized this style. Many brawlers tend to lack mobility, preferring a less mobile, more stable platform and have difficulty pursuing fighters who are fast on their feet. They may also have a tendency to ignore combination punching in favor of continuous beat-downs with one hand and by throwing slower, more powerful single punches (such as hooks and uppercuts). Their slowness and predictable punching pattern (single punches with obvious leads) often leaves them open to counter punches, so successful brawlers must be able to absorb substantial amounts of punishment. However, not all brawler/slugger fighters are not mobile; some can move around and switch styles if needed but still have the brawler/slugger style such as Wilfredo Gómez, Prince Naseem Hamed and Danny García. A brawler's most important assets are power and chin (the ability to absorb punishment while remaining able to continue boxing). Examples of this style include George Foreman, Rocky Marciano, Julio Cesar Chavez, Roberto Duran, Danny García, Wilfredo Gómez, Sonny Liston, John L. Sullivan, Max Baer, Prince Naseem Hamed, Ray Mancini, David Tua, Arturo Gatti, Micky Ward, Brandon Ríos, Ruslan Provodnikov, Michael Katsidis, James Kirkland, Marcos Maidana, Jake Lamotta, Manny Pacquiao, and Ireland's John Duddy. This style of boxing was also used by fictional boxers Rocky Balboa and James "Clubber" Lang. Undefeated heavyweight champion Rocky Marciano was an excellent swarmer and in-fighter but also had the power of a brawler. In-fighters/swarmers (sometimes called "pressure fighters") attempt to stay close to an opponent, throwing intense flurries and combinations of hooks and uppercuts. A successful in-fighter often needs a good "chin" because swarming usually involves being hit with many jabs before they can maneuver inside where they are more effective. In-fighters operate best at close range because they are generally shorter and have less reach than their opponents and thus are more effective at a short distance where the longer arms of their opponents make punching awkward. However, several fighters tall for their division have been relatively adept at in-fighting as well as out-fighting. The essence of a swarmer is non-stop aggression. Many short in-fighters utilize their stature to their advantage, employing a bob-and-weave defense by bending at the waist to slip underneath or to the sides of incoming punches. Unlike blocking, causing an opponent to miss a punch disrupts his balance, permits forward movement past the opponent's extended arm and keeps the hands free to counter. A distinct advantage that in-fighters have is when throwing uppercuts where they can channel their entire bodyweight behind the punch; Mike Tyson was famous for throwing devastating uppercuts. Marvin Hagler was known for his hard "chin", punching power, body attack and the stalking of his opponents. Some in-fighters, like Mike Tyson, have been known for being notoriously hard to hit. The key to a swarmer is aggression, endurance, chin, and bobbing-and-weaving. Notable in-fighters include Julio César Chávez, Miguel Cotto, Joe Frazier, Danny García, Mike Tyson, Manny Pacquiao, Saúl Álvarez, Rocky Marciano, Jack Dempsey, Wayne McCullough, Gerry Penalosa, Harry Greb, David Tua, Ricky Hatton and Gennady Golovkin. Since boxing involves forceful, repetitive punching, precautions must be taken to prevent damage to bones in the hand. Most trainers do not allow boxers to train and spar without wrist wraps and boxing gloves. Hand wraps are used to secure the bones in the hand, and the gloves are used to protect the hands from blunt injury, allowing boxers to throw punches with more force than if they did not utilize them. Gloves have been required in competition since the late nineteenth century, though modern boxing gloves are much heavier than those worn by early twentieth-century fighters. Prior to a bout, both boxers agree upon the weight of gloves to be used in the bout, with the understanding that lighter gloves allow heavy punchers to inflict more damage. The brand of gloves can also affect the impact of punches, so this too is usually stipulated before a bout. Both sides are allowed to inspect the wraps and gloves of the opponent to help ensure both are within agreed upon specifications and no tampering has taken place. In a fully upright stance, the boxer stands with the legs shoulder-width apart and the rear foot a half-step in front of the lead man. Right-handed or orthodox boxers lead with the left foot and fist (for most penetration power). Both feet are parallel, and the right heel is off the ground. The lead (left) fist is held vertically about six inches in front of the face at eye level. The rear (right) fist is held beside the chin and the elbow tucked against the ribcage to protect the body. The chin is tucked into the chest to avoid punches to the jaw which commonly cause knock-outs and is often kept slightly offcenter. Wrists are slightly bent to avoid damage when punching and the elbows are kept tucked in to protect the ribcage. Some boxers fight from a crouch, leaning forward and keeping their feet closer together. The stance described is considered the "textbook" stance and fighters are encouraged to change it around once it's been mastered as a base. Case in point, many fast fighters have their hands down and have almost exaggerated footwork, while brawlers or bully fighters tend to slowly stalk their opponents. At the same time, the lead foot pivots clockwise, turning the left heel outwards. Upon contact, the hook's circular path ends abruptly and the lead hand is pulled quickly back into the guard position. A hook may also target the lower body and this technique is sometimes called the "rip" to distinguish it from the conventional hook to the head. The hook may also be thrown with the rear hand. Notable left hookers include Joe Frazier , Roy Jones Jr. and Mike Tyson. A large, swinging circular punch starting from a cocked-back position with the arm at a longer extension than the hook and all of the fighter's weight behind it is sometimes referred to as a "roundhouse," "haymaker," or sucker-punch. Relying on body weight and centripetal force within a wide arc, the roundhouse can be a powerful blow, but it is often a wild and uncontrolled punch that leaves the fighter delivering it off balance and with an open guard. A slipper will also most likely be a good counter puncher. Most of the time a slipper will immediately strike their opponent back. Parry/block – Parrying or blocking uses the boxer's shoulder, hands or arms as defensive tools to protect against incoming attacks. A block generally receives a punch while a parry tends to deflect it. A "palm", "catch", or "cuff" is a defense which intentionally takes the incoming punch on the palm portion of the defender's glove. Philly Shell or Shoulder roll defense -This is actually a variation of the cross-arm defense. The lead arm (left for an orthodox fighter and right for a southpaw) is placed across the torso usually somewhere in between the belly button and chest and the lead hand rests on the opposite side of the fighter's torso. The back hand is placed on the side of the face (right side for orthodox fighters and left side for southpaws). The lead shoulder is brought in tight against the side of the face (left side for orthodox fighters and right side for southpaws). This style is used by fighters who like to counterpunch. To execute this guard a fighter must be very athletic and experienced. This style is so effective for counterpunching because it allows fighters to slip punches by rotating and dipping their upper body and causing blows to glance off the fighter. After the punch glances off, the fighter's back hand is in perfect position to hit their out-of-position opponent. The shoulder lean is used in this stance. To execute the shoulder lean a fighter rotates and ducks (to the right for orthodox fighters and to the left for southpaws) when their opponents punch is coming towards them and then rotates back towards their opponent while their opponent is bringing their hand back. The fighter will throw a punch with their back hand as they are rotating towards their undefended opponent. The weakness to this style is that when a fighter is stationary and not rotating they are open to be hit so a fighter must be athletic and well conditioned to effectively execute this style. To beat this style, fighters like to jab their opponents shoulder causing the shoulder and arm to be in pain and to demobilize that arm. Fighters that used this defense include Sugar Ray Robinson, Ken Norton (also used this defense), Pernell Whitaker, James Toney, and Floyd Mayweather Jr. The "rope-a-dope" strategy : Used by Muhammad Ali in his 1974 "the Rumble in the Jungle" bout against George Foreman, the rope-a-dope method involves lying back against the ropes, covering up defensively as much as possible and allowing the opponent to attempt numerous punches. The back-leaning posture, which does not cause the defending boxer to become as unbalanced as they would during normal backward movement, also maximizes the distance of the defender's head from his opponent, increasing the probability that punches will miss their intended target. Weathering the blows that do land, the defender lures the opponent into expending energy while conserving his/her own. If successful, the attacking opponent will eventually tire, creating defensive flaws which the boxer can exploit. In modern boxing, the rope-a-dope is generally discouraged since most opponents are not fooled by it and few boxers possess the physical toughness to withstand a prolonged, unanswered assault. Recently, however, eight-division world champion Manny Pacquiao skillfully used the strategy to gauge the power of welterweight titlist Miguel Cotto in November 2009. Pacquiao followed up the rope-a-dope gambit with a withering knockdown. Floyd Mayweather, Jr. employed the use of a check hook against Ricky Hatton, which sent Hatton flying head first into the corner post and being knocked down. Hatton managed to get himself to his feet after the knockdown but was clearly dazed and it was only a matter of moments before Mayweather landed a flurry of punches which sent Hatton crashing to the canvas, giving Mayweather a TKO victory in the 10th round and handing Hatton his first defeat. Boxer Yusuf Ahmed in corner of the ring. Knocking a person unconscious or even causing concussion may cause permanent brain damage. There is no clear division between the force required to knock a person out and the force likely to kill a person. Since 1980, more than 200 amateur boxers, professional boxers and Toughman fighters have died due to ring or training injuries. In 1983, the Journal of the American Medical Association called for a ban on boxing. The editor, Dr. George Lundberg, called boxing an "obscenity" that "should not be sanctioned by any civilized society." Since then, the British, Canadian and Australian Medical Associations also have called for bans on boxing. Professional boxing is forbidden in Iceland, Iran and North Korea. It was banned in Sweden until 2007 when the ban was lifted but strict restrictions, including four three-minute rounds for fights, were imposed. It was banned in Albania from 1965 till the fall of Communism in 1991; it is now legal there. Norway legalized professional boxing in December 2014. The WBHF was founded by Everett L. Sanders in 1980. Since its inception the WBHOF has never had a permanent location or museum, which has allowed the more recent IBHOF to garner more publicity and prestige. Among the notable names in the WBHF are Ricardo "Finito" Lopez, Gabriel "Flash" Elorde, Michael Carbajal, Khaosai Galaxy, Henry Armstrong, Jack Johnson, Roberto Durán, George Foreman, Ceferino Garcia and Salvador Sanchez. Boxing's International Hall of Fame was inspired by a tribute an American town held for two local heroes in 1982. The town, Canastota, New York, (which is about 15 miles (24 km) east of Syracuse, via the New York State Thruway), honored former world welterweight/middleweight champion Carmen Basilio and his nephew, former world welterweight champion Billy Backus. The people of Canastota raised money for the tribute which inspired the idea of creating an official, annual hall of fame for notable boxers. The International Boxing Hall of Fame opened in Canastota in 1989. The first inductees in 1990 included Jack Johnson, Benny Leonard, Jack Dempsey, Henry Armstrong, Sugar Ray Robinson, Archie Moore, and Muhammad Ali. Other world-class figures include Salvador Sanchez, Jose Napoles, Roberto "Manos de Piedra" Durán, Ricardo Lopez, Gabriel "Flash" Elorde, Vicente Saldivar, Ismael Laguna, Eusebio Pedroza, Carlos Monzón, Azumah Nelson, Rocky Marciano, Pipino Cuevas and Ken Buchanan. The Hall of Fame's induction ceremony is held every June as part of a four-day event. Former IBF, WBO and WBA Heavyweight Champion, Ukrainian Vladimir Klitschko. There are various organizations and websites, that rank boxers in both weight class and pound-for-pound manner. ↑ Leonard–Cushing fight Part of the Library of Congress Inventing Entertainment educational website. Retrieved 12/14/06. ↑ Stiff Jab — Gym Diary: Oct. 31, 2011. Stiffjab.com (31 October 2011). Retrieved on 2013-08-25. Wikimedia Commons has media related to Boxing. Wikisource has the text of the 1911 Encyclopædia Britannica article Boxing. This page was last modified on 30 September 2017, at 20:03.